2016 Miles Franklin Award Winner. 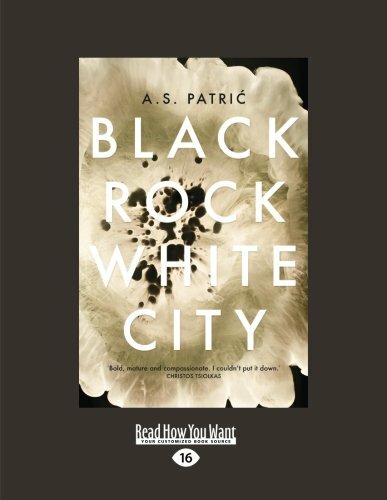 Debut novel by Melbourne writer AS Patric, He also works part time at Readings in St Kilda. The author describes the book as ‘essentially a love story'. I found this quite a distressing book to read. The sadness of the characters comes as no surprise given the couple Jovan and Suzana have fled war torn Bosnia after the death of their two children. Now living in Australia they are trying to set up a new life in the working class suburb of Frankston, barely existing, taking menial jobs as cleaners. Their former jobs as University professors in Sarajevo nothing but a distant memory. They come to Australia with damaged souls. Running parallel with this story is another - a mystery surrounding Jovan's workplace in a hospital in Black Rock where someone leaving graffiti with cryptic messages leads to murder. The novel takes a turn and captures the intensity and suspense of a psychological thriller. The ending had an anti-climax in terms of discovering who the murderer was. However I don't think the author intended this to be a huge focus. The book touches on the very current global issues with the refugee crisis. It depicts the hurt, anger and the ongoing struggle refugees are facing to just live. It’s a powerful insight into the immigrant experience. It's raw, confronting and thought provoking.